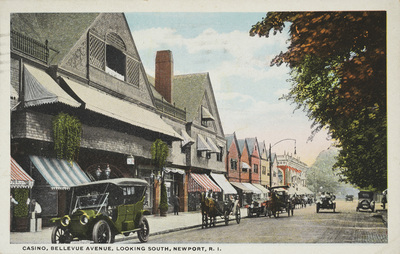 "Casino, Bellevue Avenue, Looking South, Newport, R. I." by Morris Berman, New Haven, Conn.
Casino, Bellevue Avenue, Looking South, Newport, R. I.
Morris Berman, New Haven, Conn.
Used. Postmark: August 27, 1921. Morris Berman, New Haven, Conn., "Casino, Bellevue Avenue, Looking South, Newport, R. I." (1921). Rhode Island Postcards. 371.